It’s hard to walk away from a conversation with Rosa without feeling lighter. Like life is more managable. Happier. That’s who she is. Rosa Taracena is a light. As a family advocate at Volunteers of America, Rosa works directly with dozens of families as they together tackle a challenging season of life. The joy she carries with her is felt in the questions she asks, the support she offers, and the smiles she so often allows herself to be consumed by. Rosa helps families understand their hurdles as well as their strengths. When she sees a need, she fills it. 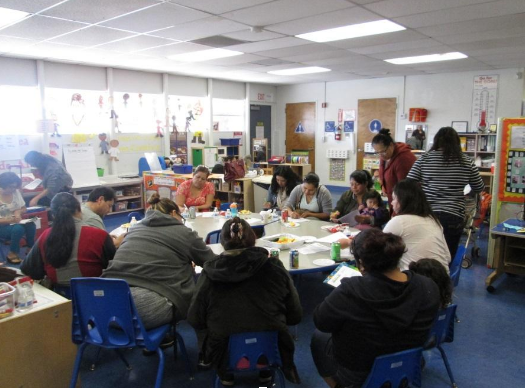 Recently, Rosa facilitated a bi-weekly Parents Circle, where together her families tackle topics of school readiness and overall well-being. The CommuniGift team first came to understand Rosa and her special heart when we spent the day with Omar and his adoptive grandmother, a family Rosa works with throughout the year. In Omar’s case, the family of 6 shares a single-room apartment. Every morning grandmother Maria walks Omar to the Volunteers of America Head Start program. Here kids can count on two meals and a safe place to learn and grow. It’s Rosa’s mission to connect families with these pillars of support. A wife, a mother of two, and a grandmother of three—Rosa is also a hero on the homefront. Just two minutes after meeting her, Rosa was rattling off the names and interests of those she holds so dear, including her neice. She was beaming the entire time. We, along with the team at Volunteer of America of Los Angeles, are celebrating the incredible person Rosa is and the degree to which her dedication and support has led to the advancement of everyone around her.